High quality custom ad glass to complete a museum quality restoration. Ad Glass panels are $25.00 Each + $20.00 S&H for one pair or $25.00 for two pair. Our Ad Glass panels are custom created to your exact specifications. All are made by attaching a high quality vinyl decal to a piece of 'double strength' glass..
light bulbs to avoid fading and scorching. If used outdoors - or with incandescent lights - they will fade. 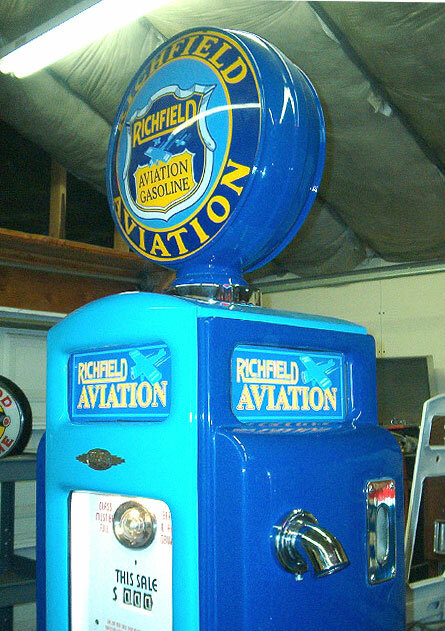 "I need ad glass for a Bennett 371 to go with your Richfield Aviation Lenses." We create some preliminary art and send you a .jpg for approval. "That looks nice - but can you use the plane art from the lens? And reverse the background colors?" "Looks prefect. I need 4 of those." It takes about a week to get the outputs and make up the Ad Glass panels. Then we ship them out to you. Any image on this site can be converted into an Ad Glass panel. If you need custom Ad Glass for a brand not shown on this site, contact us. with NO ART CHARGE !